Although a rocky hillock vegetation are sparsely found in and around it. 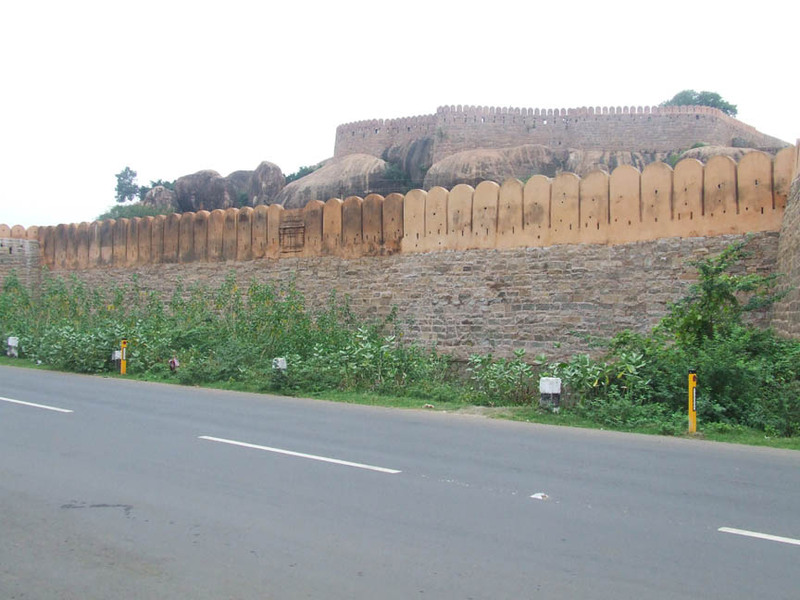 The fort in and around the hillock and the village is one among the few vestiges of the medieval strategic architecture in Tamil Nadu. The hillock with the fort is conspicuous even miles apart. The nameless upper rock-cut cave5 hewn on the western face of the hillock has an aperture of 2.08mts height and .98mts width as entrance. The door frame has jambs and lintel and in addition on either side of the entrance attempt has been made to ornate with successive door frames with a square base shown below. The rock cut cell is 2.74mts in the east-west and 2.93mts in the north-south directions and 1.98mts height. 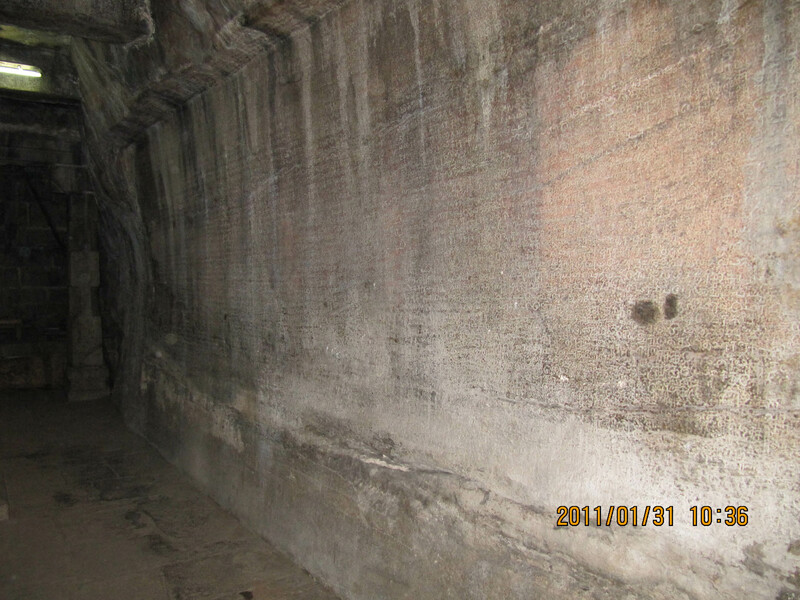 The rock cut linga with square avudaiyar and rudra bana is carved in the middle of the cell. 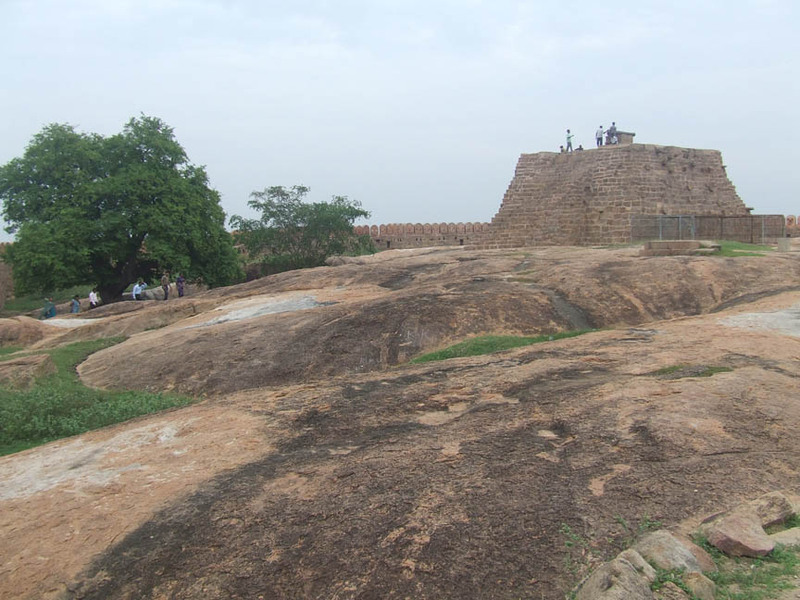 The avudaiyar with a height of .65mts and of sides’ .90mts is formed as an adhishthana. The rudra bana is .59mts height. 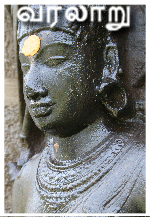 The avudaiyar has the components of jagadi, rudra kumudha, kanda with pada flanked by kambu, pattika and upari kambu. A small gomukha is shown on the north held by a squatted gana on its head. The gana is squatting on the lower kambu by placing its hands on its knees. A pit is formed to a depth of .50 mts on the floor to collect the sacred water, but water chute is absent in the floor to outlet the water. 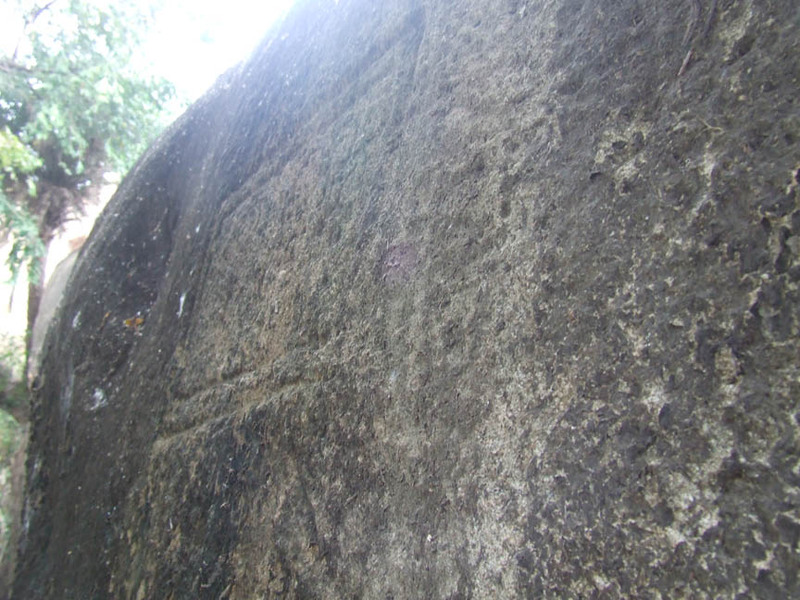 To the north of the entrance a pair of rectangular outline is shown and the script inside is much worn-out, the similar style of depiction at Sathyagiriswara rock cut shrine make us to assume that it might be the term ‘Parivadini-da’. The ASI has fixed ladder to reach the shrine. On the southern precipice of the hillock both the caves are hewn at its foot adjacent to each other. 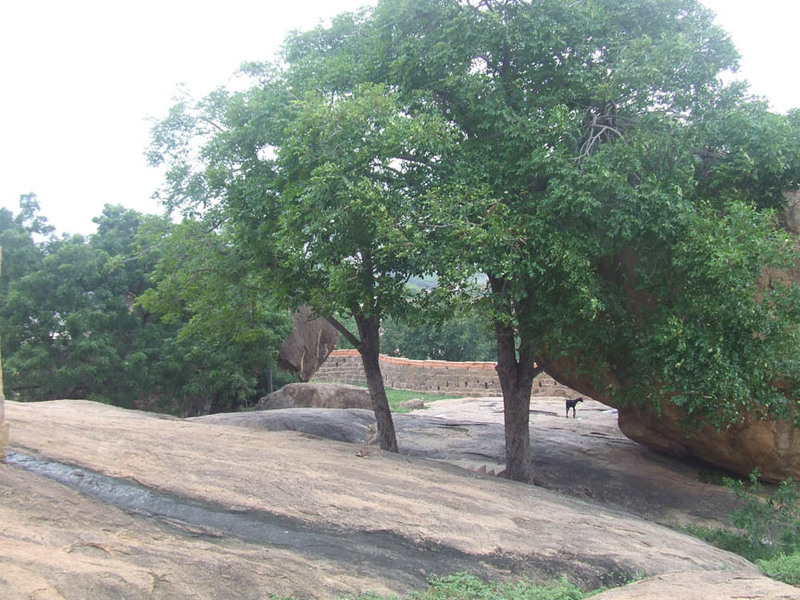 The hillock has a natural cavity in the region where the two rock cut caves are excavated. 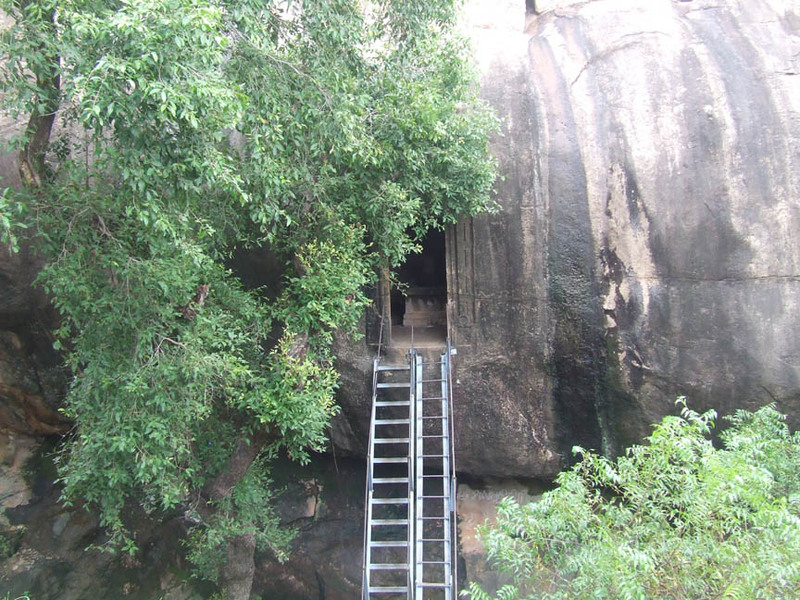 The Sathyagiriswara cave is to the west of the Sri Thirumeyyar cave, which is separated by a wall. Both these rock cut shrines which were once in a single complex were separated into two complexes during the 13th century due to schism among the followers of the two sects.6 After the partition both the rock cut shrines had many later additions like pillared mandapas, shrines, sub-shrines and gopuras which led to grow into multifaceted complexes. The gopura entrance in the south forms the main entrance to the Sathyagiriswara temple complex. It is a three-tier nagara structure with sala shikara and the upper talas are adorned with interesting sculptures. A huge compound wall extends on either side of the gopura encompassing the temple complex and ends adjoining the mother rock. Inside, adjoining the western wall thiruchurru is shown for the full stretch of the wall and a passage in the middle leads to the huge Pushkarani formed at the foot of the hillock. 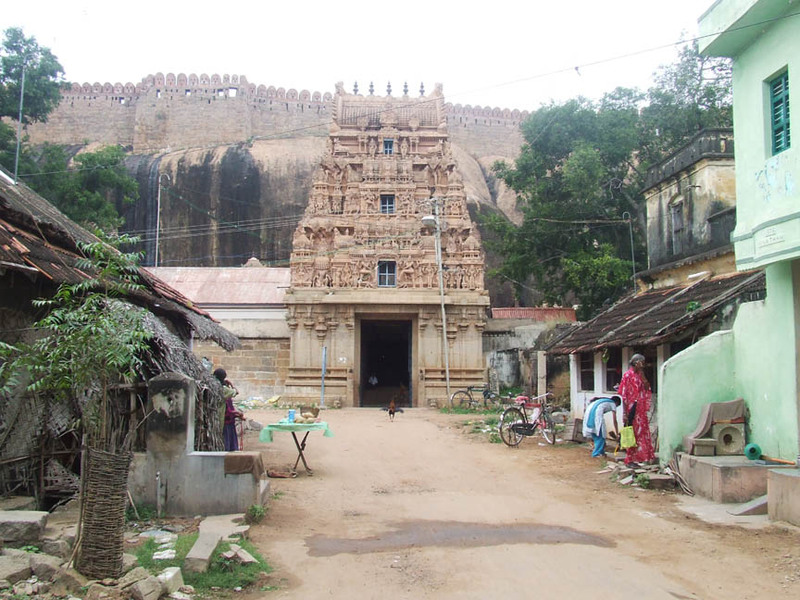 The eastern wall separates the Siva and Vishnu caves as two separate temple complexes and adjoining the eastern wall temple vahanas are kept in a closed provision. On the western side of the complex a small Vinayaga shrine consists of a sanctum and a porch is seen facing east. Next to the Vinayaga shrine is a hall adorned with paintings on the ceiling and sidewalls, at present functioning as office of the temple. A corridor from the gopura leads to the outer mandapa which can be reached by a flight of steps. It is a pillared hall with a big shrine and sub-shrines around it. 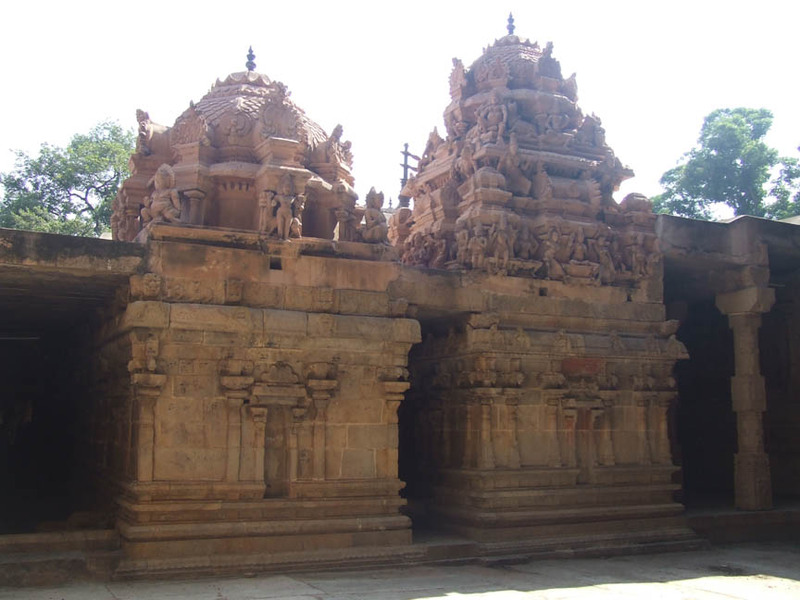 The Banu Umapathiswara shrine dedicated to Lord Siva consists of a sanctum and a mukha mandapa facing east. The nagara vimana is a three tier structure with vesara crown. 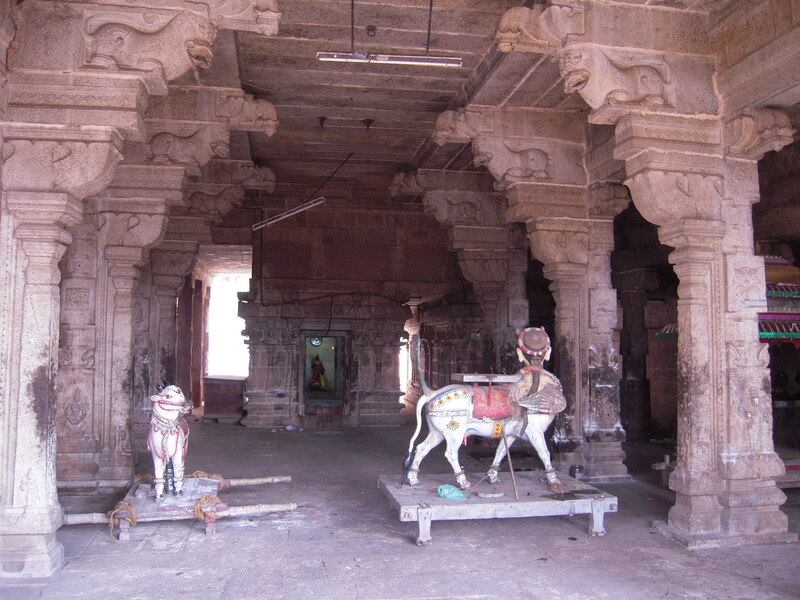 Nandi, Surya and Chandra are oriented to the shrine in the front. Behind the shrine two pairs of small sanctums are seen facing east. The pair in the south is dedicated to Vinayaga and Siva, whereas the pair in the north houses Gajalakshmi and Muruga. And in the north a shrine for Chandeswara is seen facing south. The eastern side of the mandapa is little lowered where the dvajastamba, the Planetary group, and the shrines of Bhairava, Rarajeshwari are seen. The dvajastamba is on a raised pedestal which is shown as a kapotabanda adhisthana. The pillars of the mandapa are massive and arty where the lower squares are adorned with interesting miniatures, scrolls and the upper squares are adorned with flower medallions. The shrines of Bhairava and Rajarajeshwari are almost identical with a sanctum and a mukhamandapa. The Rajarajeshwari shrine has a two-tier nagara vimana with dravida shikara and the upper tier is adorned with sculptures. The vimana of the Bhairava shrine is single tala with dravida shikara. 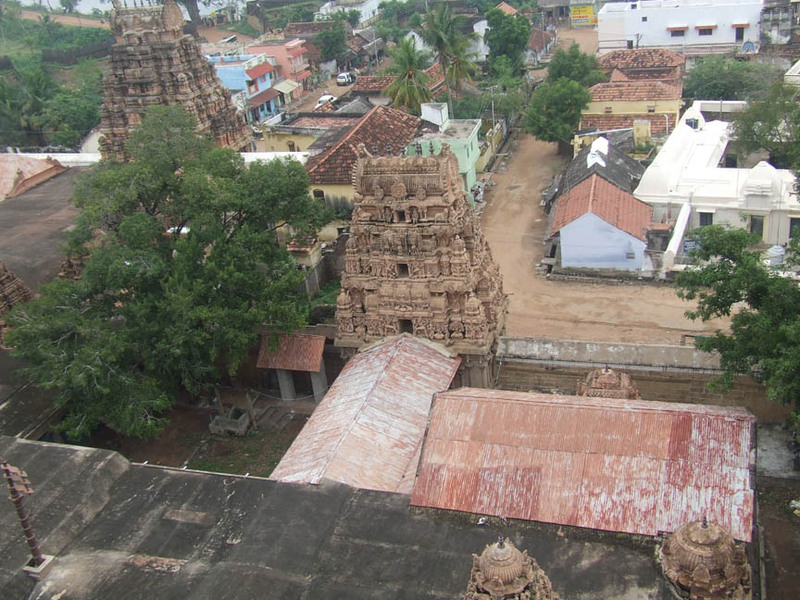 The Navagriha has wooden roofing over it. 1. Field visits on 30-11-2008, 02-02-2009, 26-01-2009, 05-02-2010, 31-01-2010, 11-07-2010, 14-08-2010. 3. Gazetteer of India, Tamil Nadu District Gazetteers, Pudukkottai, The Director of Stationary and Printing, Madras, On behalf of Government of Tamil Nadu, 1983. P.15-16. 5. 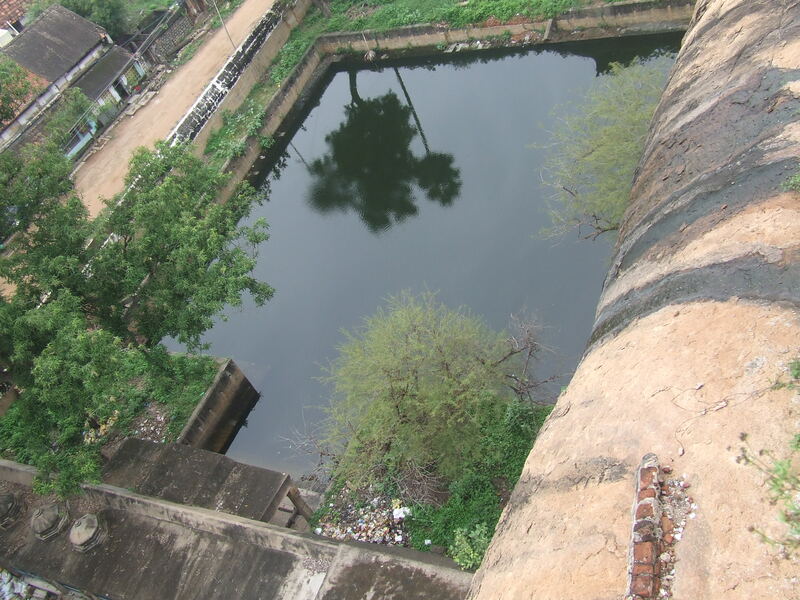 R.,uhrntY/ m.fp.nr\hj;jphp/ jkpH;ehl;Lf; Filtiuf; nfhapy;fs;/ (Cave Temples of Tamil Nadu) gz;ghl;L btspaPl;lfk;/ brd;id 2000./ ‘jkpH;ehl;oy; Filtiufiyf;nf Kd;ndhoahd ,f;Filtiu tps';fpapUj;jy; ntz;Lk;. knfe;jputh;kh; fhyj;jpw;F Kw;gl;ljhf ,J mike;Js;sJ’. The authors didn’t give any authentic source for their proclamation. P.188. b#.uh#hKfkJ/ Mtzk; 19/ g[Jf;nfhl;il khtl;l Filtiuf;nfhapy;fs;/ 2008. “g[Jf;nfhl;il khtl;lj;jpd; fhyj;jhy; Kw;gl;l Filtiu ,Jthfyhk; vd R.uh#ntY fUJfpwhh;. MapDk; ,Jt[k; Vid Filtiuapd; rkfhyj;ijr; nrh;e;jJ vdf; bfhs;s ntz;oa[s;sJ’. It is unable to understand which rock cut cave the author is defining for period. P.172.